Since introducing some plant life into our bedroom “part-makeover” we are converts to having indoor plants. 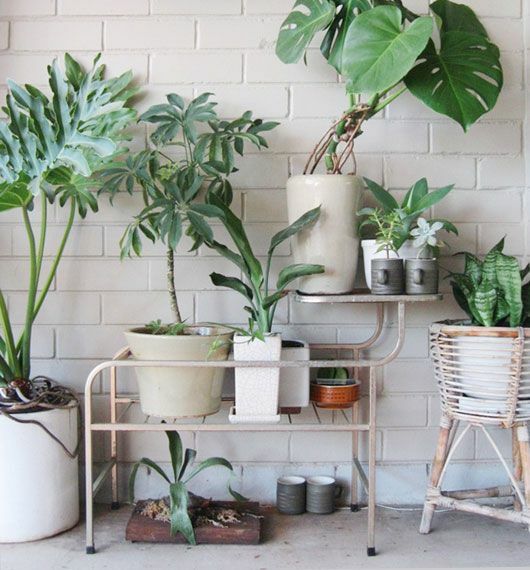 Who knows if it’s the rush of refreshed air that puts the smile on our faces as we walk into our room, or just the pleasing look of green leaves in a mostly white room that makes me happy? No matter… we’ll be adding more! Roomie clearly knows what I’m talking about – this one popped up on my Pinterest feed from them today. This entry was posted in Interiors and tagged eclectic, green, indoor plants, pin of the day, pinterest on August 11, 2014 by Jolene. I love this! We’ve got unfinished blond wood open shelves in our bathroom, where I store our (visually acceptable) towels. There’s a peace lily on the top shelf, and it just makes me so happy to have that one living thing in there.